SAN storage provides a reliable way to protect data using data storage by creating a dedicated network solely for storage traffic. A SAN can have many different types of data storage connected and you can create a Fibre Channel SAN, iSCSI/IP SAN or SAS SAN, from this you can connect different types of storage including disk and tape. 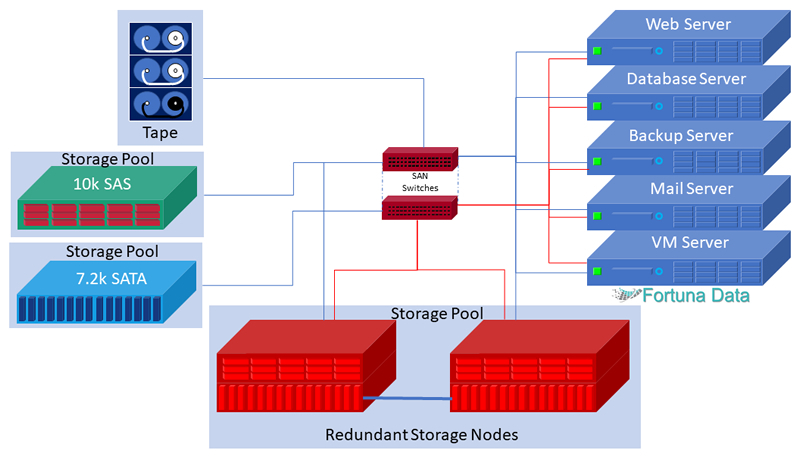 Normally a SAN will have multiple levels of redundancy built-in to enable the SAN storage and servers to access block data across the network in the event of failure. Whilst a SAN provides a high level of performance and can simplify storage management, things start to get complicated the more storage systems are added to the storage area network when you have multiple servers connecting to many different storage pools. SAN storage provides for better disk space usage as the disk can be carved up to provide space to multiple servers and applications, also many storage systems also provide thin provisioning, snapshot, replication and many other features. Wherever possible ensure your storage has redundant controllers, multiple NIC ports and supports SSD. Whilst SAN storage has dominated the datacentre space for the past 15 years with the first affordable fibre channel network running 1Gb/s the market is now moving to a software-defined and hyper-converged model. This removes the complexity of having an intelligent storage array from different storage vendors that don’t interact due to the built-in software and allows for a much lower entry point to buying storage and no vendor lock-in. Current fibre channel speeds run at 32Gb/s, most deployed FC networks are 8-16Gb/s. An IP or iSCSI SAN has traditionally run at 10GbE, but network cards and switches are now making 25-100GbE more affordable to deploy and will eventually replace fibre channel due to the reduced cost, greater performance and less complexity from trying to manage two networks. We provide a host of SAN storage products that can be a robotic tape library, all-flash array, hybrid array with flash and hard disk or a traditional disk array supporting the latest 14TB drives and SSD drives. The SAN storage systems can be supplied with multiple controllers cards to support either iSCSI or Fibre Channel and fully support active-active failover and VMware VAAI. If you would like to know more call us on 01256 331614 or 0207 193 5760 or complete our form below.